Using you Kitchen Aid stand mixer, combine cream cheese, powdered sugar and creamer on medium high for 1-2 minutes until smooth and creamy. Set aside. In a large bowl, combine boxy of dry cake mix, pumpkin, 3/4 water, cinnamon and pumpkin pie spice. Stir until smooth and combined. Spread pumpkin mixture into your prepared pan. 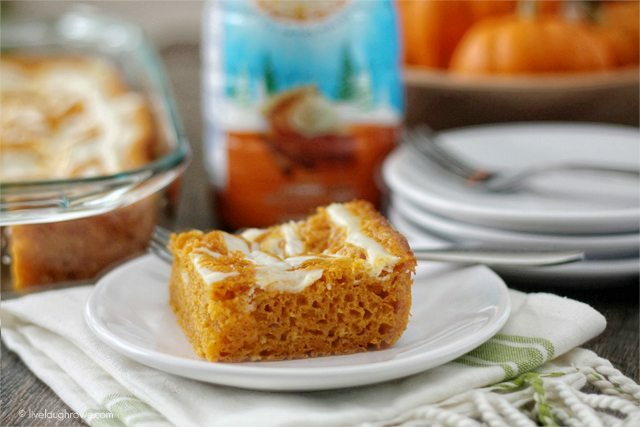 Drizzle your creams cheese on top of the pumpkin mixture and swirl it in with a butter knife. Bake for 25-30 minute until center is set and toothpick comes out clean.